Ixigo’s New ‘ixibook’ Feature Now Allows in-app travel bookings! 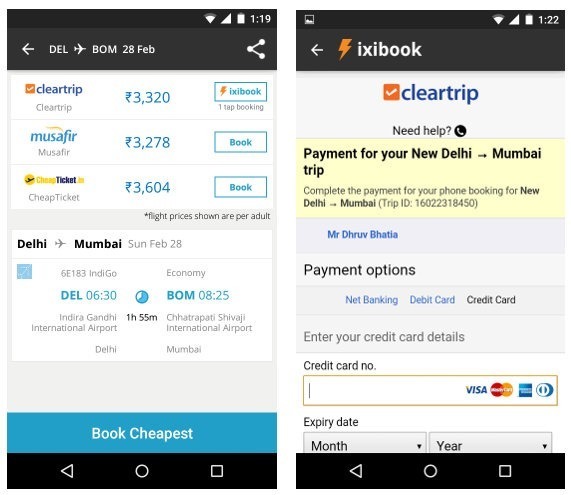 Ixigo’s New ‘ixibook’ Feature Now Allows in-app Flight & Hotel Booking! Ixigo has been one of top online travel ticket aggregation and search platform for a long time. Till now, Ixigo users could search for flights and hotel needs and had to visit partner website to make the purchase. Now Ixigo has launched ‘ixibook’ that allows users to book their flight tickets or do the hotel bookings directly inside the ixigo app, without the need to go to the partner website. ixigo has currently partnered with Cleartrip and OYO Rooms to provide this feature. According to the official blog post, user payments for flight and hotel bookings will be done through Cleartrip. To do bookings on ixigo app itself, user needs to simply add traveler information (one time) to the app, and it will pick up the same information in all subsequent transactions. If the user wishes to add other travellers or make any edits in their existing information, it can either be done manually or then the app will prompt the user to do it on the flight search page while doing the booking. The ixibook feature is currently available on ixigo’s Android app only. Do give this new feature a spin and let us know your experience. "Ixigo’s New ‘ixibook’ Feature Now Allows in-app Flight & Hotel Booking! ", 5 out of 5 based on 1 ratings. Should Startups be Spending on Designing Swanky New Office Spaces? India Post Goes Digital – 1.5L Post Offices To Be Digitalized; Handheld Devices For Postman!